A subject your target market is interested in, sure. But what about images? A story? The font? What about length? Line-width? You might think you know the answer to those questions (I definitely did). But the fact of the matter is that you probably don't have proof. You couldn't take your article up to your boss and say "I can prove to you that this is the best article I could have written." There's enough content out there (and has been for a while) for academic researchers and businesses to study what works and what doesn't, what people love and what they immediately bounce from. 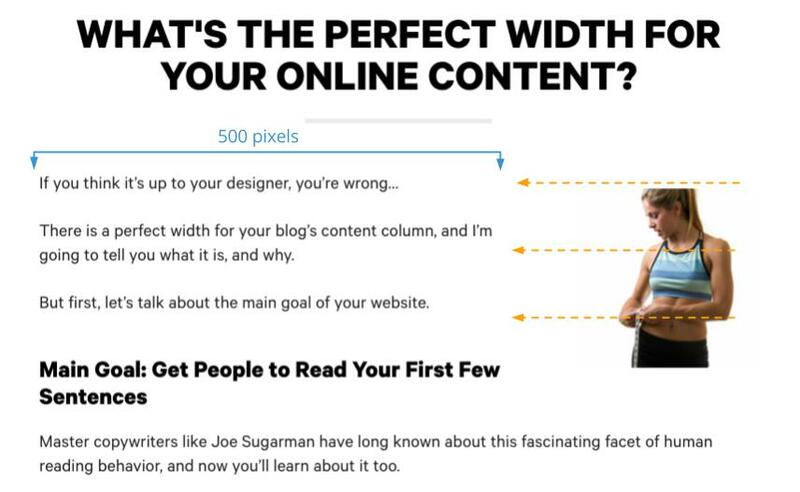 This article will break down the perfect blog article, according to science, and boost your readership as well. Check out the data in spreadsheet format here. But does greater length perform best? Do people want comprehensive or do they want palatable? More content, or content delivered quickly and accurately? Let's take a look at a few graphs..
Quicksprout reports that their 1,500+-word articles receive 68% more Tweets and 22% more Facebook Likes than their average-length content. 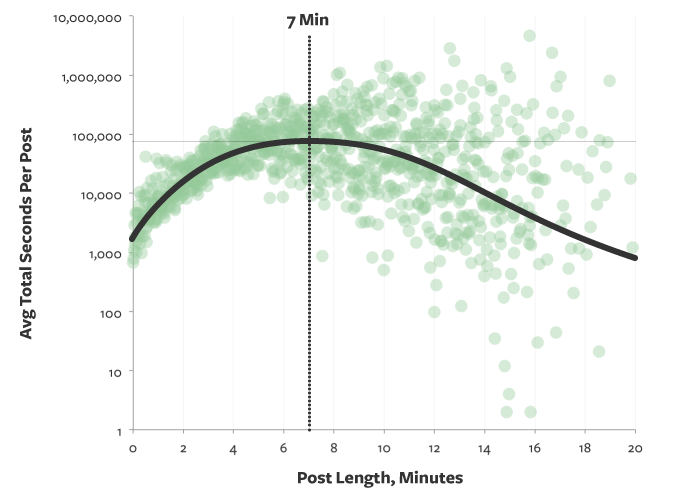 Analysis: The average total seconds spent reading rises for longer posts, peaks at 7 minutes, and then declines. So we're sold on longer content. But we're also aware our blog visitors are reading about 28% of the words in a blog post (as Nielsen says they are). So we need to make the content they do see interesting, to drive them to continue. 1. Grab them with a story. The Groove blog actually A/B tested this, sending half their visitors to a "version of the post that started with a simple story that led into the “meat” of the content, while others found a post with a no-nonsense intro that jumped right to the point." Use bullet-points, subheaders, headers and start with eye-grabbing words. This is common-sense, and you should already be doing it. People need to be told how to read your article. Nielsen also found (in the study I mentioned above) their famous "F-Shape" reading behavior - the fact that people tend to start reading from the left to right and then move down a page in a similar manner before they stop and just eye the left side. Subheaders: Bolded, larger font which make skim-reading easier - ideally actionable. Eye-grabbing words: This can be a bit more challenging, but studies show that (like their own names) people can hear words like "free" and "dollars" from across a room where they otherwise wouldn't. It works the same with text. Short paragraphs: If you break your paragraphs up into shorter, more palatable sentences, need to read the next line to get the full value. This pulls them down the page bit by bit. Images: Not only do images break up text and pull the reader's attention in and down, but, as we saw in the infographic from BlogPros above, the most successful articles have an image at least every 350 words. In 2004, research was done to determine the optimal width for reading. She found that 100 characters per line is the best for reading speed, but that people prefer 45-72 characters. 45-72 characters corresponds to a page about 500 pixels wide (this paragraph is 500 pixels wide) and would leave a large amount of whitespace on either side (this paragraph, by the way, is 500 pixels wide, and, as you can see, looks ridiculous). Our blog's line-width (and most others) is about 775 pixels wide. So how do we both address people's preferred linewidth but keep our articles looking good? "Make the beginning part of your article a shorter line length than the rest of your article. Mary Dyson (2004) conducted research on line length, and combed other studies to determine what line length people prefer. Her work showed that 100 characters per line is the optimal length for on-screen reading speed; but we prefer a short or medium line length (45 to 72 characters per line). Serif: Serif fonts have little “feet” or lines attached the ends of their letters. They’re generally thought to look more serious or traditional.' Sans-Serif: “Sans-serif” literally means “without serif” — these fonts don’t have the extra lines on the ends of letters. For that reason, they’re generally thought to look more modern and streamlined. Many designers agree that, in print, serifs make longer passages easier to read and understand. However, because serifs are typically thinner (Butler, Contra and Fontin excluded), they might not display well in the digital medium. So many designers use sans-serif for the web. For font and typeface pairings, check out "digitalsynopsis.com or femmebot (a github site). FontsInUse is also a cool site to see real-world examples of font combos. Top Tip: If you can get your hands on Avenir or Avenir Next, it was the most frequently mentioned font when 40 top designers weighed in on their favorite fonts (it's also what Apple uses frequently). It is a bit pricy though. We read based on recognizing both context and the shapes of the letters and words. We don't actually reading each one. We read in leaps and jumps of seven to nine letters (called saccades) and where we land (a fixation) determines our understanding of words. If text is written in caps, our brain doesn't recognize the fixations. It makes it harder to understand and read all-caps text. The Pew Research Center published a study on mobile reading habits in May of 2016. Their findings were drawn from "months digging deeply into the details of 117 million anonymized, complete cellphone interactions with 74,840 articles from 30 news websites in the month of September 2015." Despite what you might think (with small screen space and multitasking) people still spend more time on long-form articles than they do on short-form. 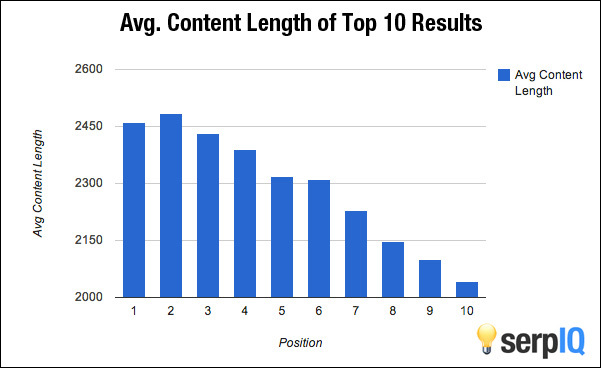 Average engage time on articles with 1000+ words is 123 seconds. 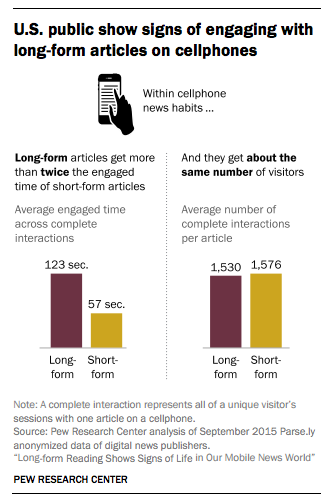 Shorter-form articles are 57.1 seconds. This makes sense, but only if you consider that an article twice as long as another should only have twice the time-on-page if people don't care about its length. In other words, don't worry about mobile readers. They'll still read your long-form articles. Just make sure those articles look good on mobile! Hopefully this article has given you a more scientific understanding of what makes a great blog article.